The following story is about the mid air collision that occurred on December 4th , 1965 between an Eastern Airlines Constellation flight 853 and TWA B-707 Flight 42. And the miraculous landing made by the Eastern crew. Also the heroism of Captain Charles White, Eastern Airlines. All information for this article was taken from newspaper reports, the CAB accident report, and a story that was written in Readers Digest entitled “Ten Minutes to Live” by Warren R. Young. THIS IS MY SALUTE TO THESE HEROIC CREW MEMBERS OF EASTERN 853 AND TWA 42. On December 4th , 1965 the weather over northeastern New York was in a post frontal zone with a frontal system extending into the Atlantic Ocean from a low pressure area centered 100 to 150 miles of the Massachusetts coast. The weather over White Plains, New York was 4,000 feet scattered clouds, 8,000 feet broken clouds, 12 miles visibility, temperature 46 degree F, dew point 35 degree F, wind from 300 degrees at 7 knots. The weather over the Carmel VORTAC at 16:19 est. called for variable cloud conditions with the tops at or near 8,000feet and isolated tops up to 13,000 feet. There was also a broad area of scattered rain showers in the area. After climbing out of Syracuse a corporate pilot reported the weather as, through multi-layered clouds after his departure from Syracuse, and was on top of an overcast at l5,000 feet, approximately 25 miles southeast of Syracuse. He described the overcast as continuous and relatively smooth with some billowing in the Carmel area. At 1645, approximately 30 minutes after the accident, he descended in the area of the Camel VORTAC and reported that he was just clear of the tops of the clouds at 11,000 feet and in the clouds at 10,000 feet. He also reported the visibility was unrestricted above the overcast. At 9:05 P.S.T. (TWA) Trans World Airlines Flight 42 departed San Francisco International Airport, San Francisco, California on an IFR flight plan to John F. Kennedy Airport, New York. 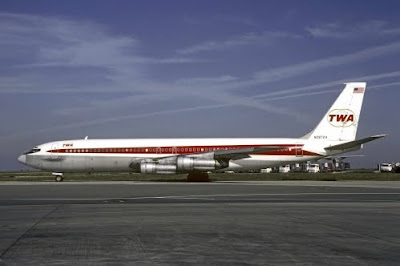 TWA 42 was a red and white Boeing 707-131B tail number N748TW. At the time of departure in San Francisco TW 42 had a take off gross weight of 222, 174 lbs. On board the aircraft was 82,000 lbs of fuel. The flight was routed via Sacramento, California, Reno, Nevada, Sioux Falls, South Dakota, and Buffalo, New York, at various altitudes. At Buffalo, the log indicated the flight was at flight level (FL) 370 at 1548. 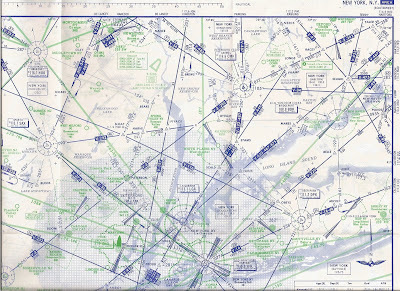 Subsequently, the flight descended to FL 250 under the control of the New York Air Route Traffic Control Center (ARTCC). TW 42 was then cleared to descend to FL 210 and later to 11,000 feet m.s.l., and was given the JFK altimeter setting of 29.63. The flight reported level at 11,000 feet During the entire flight there were no maintenance discrepancies logged in the log book for the flight.. The flight crew of TW 42 was a very experienced crew with a perfect safety record. 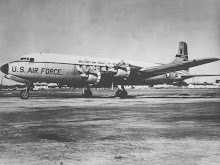 In command of TW 42 was Captain Thomas H. Carroll of TW 42, age 45, was employed by Trans World Airlines on September 24, 1945, and was promoted to captain on Nay 28, 1956. He had a total of 18,842 flying hours, 1,867 of which were in Boeing 707 aircraft. He held valid FAA airline transport pilot certificate which included a type rating in Boeing 707 aircraft. His last proficiency and line checks in the Boeing 707 aircraft were on September 7, 1965, and October 17, 1965, respectively. His last first-class medical certificate was dated September 22, 1965, with no limitations. At 15:38 E.S.T. Captain Charles J. White age 42, who was employed by Eastern Air Lines on October 26, 1953. Captain White had a total of 11,508 flying hours of which 1,947 were in L-l049 aircraft. He held valid air transport pilot certificate with a type rating in L-1049 aircraft. His last proficiency check and line check as on November 8, 1965, and November 5, 1965, respectively. His last first-class medical examination was dated October 25, 1965, with no waivers. His First officer was Roger I. Holt, Jr., of BA 853, age 34, was employed by Eastern Air Lines on February 5, 1962. He had a total of 8,090 flying hours, 899 of which were in L-1049 aircraft. He had 241 hours in L-1049 aircraft as flight engineer. He held valid FAA commercial pilot certificate No. 1095281 with appropriate ratings, and FAA flight engineer certificate No. 1542827. He also held a valid free balloon pilot rating. His last proficiency check was dated September 14, 1965. His last first-class medical examination was dated March 9,1965, with no waivers. The Second officer was flight engineer Emile P. Greenway, age 27, was employed by Eastern on January 27th, 1964. He had a total of 1,011 flying hours of which 726 were in the L-1049. He held a valid commercial pilot certificate and flight engineer certificate, his last check ride was dated July 17, 1965. 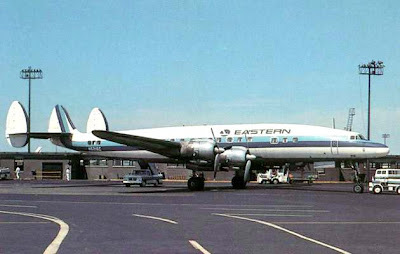 The big Blue and White striped Eastern Airlines Lockheed, 1049C Constellation designated as Flight 853 a normally scheduled shuttle flight departed Boston, Logan Airport for a flight to Newark, New Jersey. At the time of takeoff the Connie had an operating weight of 97, 019 lbs well below the maximum allowable Gross Takeoff Weight of 113,075 lbs. The flight climbed to 10,000 ft. and went into cruise. ATC control at Boston handed off the flight to New York ARTCC at 16:10. E.S.T. At 16:18 E.S.T. New York ATC recorded on the flight strip for EA 853 that the aircraft was passing Carmel VORTAC. The flight plan called for EA 853 to fly southwest out of Boston, direct to the Carmel VORTAC, where they would be given descent clearance for vectors into Newark, Airport. TW 42 was cruising in clear air as it approached the Carmel VORTAC at a groundspeed of 355 knots on a track of 128 degrees. They were flying above the overcast with no restrictions in visibility. The aircraft was flying on auto pilot with the altitude hold feature engaged. Captain Carroll had his left hand on the control yoke. Looking out of his window Captain Carroll observed a blue and white aircraft at his 10 o’clock position in what he assumed was on a collision course with his aircraft. He immediately disengaged the auto pilot by actuating a switch on the yoke with his left thumb, put the wheel hard over to the right and pulled back on the yoke. At the same time first officer Smith grabbed the yoke and followed through with the Captain’s movement of the yoke. As the big 7070 rolled to the right it became evident to the crew that they were not going to avoid a collision, the crew immediately reversed the direction of the yoke to the left. Before the aircraft had a chance to react to the control reversal, two shocks were felt and the big jet entered a steep dive. The crew regained control and began emergency assessment of the problem. As TW 42 passed under and toward the rear of Eastern Flight 853 the No. 1 cowling and a portion of the left wing of the 707 struck the underside of the main fuselage of the Constellation. The collision tore out the hydraulic boost package and the control cables to the rear empennage of EA 853, rendering the elevator and rudder flight controls inoperative. Contacting New York ARTCC TW 42 immediately declared an emergency and informed them that their left wing tip was missing. New York ATC issued vectors and a descent clearance to JFK airport. After arriving southeast of JFK airport they began flying a large 360 degree left turn in order to ascertain that the landing gear was fully down and locked. TW 42 landed safely at on runway 31L at approximately 1640. TW 42 showed primary impact damage in three areas: (1) the outer left hand wing panel from the No. 1 nacelle outboard was severed; (2) the No. 1 engine cowl and pylon showed impact abrasions from sliding contact but did not separate from the aircraft; (3) the wing leading edge at wing station 555 just inboard of the No. 1 engine had sustained a deep slash. In addition, secondary structural damage was noted from impact loading and flying debris. As Eastern Flight 853 approached Carmel VORTAC on a track of 252 degrees and a ground speed of 213 knots, the connie was in level flight at 10,000 ft indicated, flying in and out of the tops of a “fluffy” cloud deck with the tops of the clouds about 300 feet above their level. They were cruising along with an airspeed of 205 to 210 KIAS. They were flying into the sun but the crew needed neither sunglasses nor use of their glare shield. Just as EA853 emerged from a cloud puff First Officer Holt observed a jet aircraft from his right side window he estimated to be at his 2 o’clock position. The aircraft appeared to be converging at the same altitude as EA853. Holt immediately exclaimed “Lookout”, and placed his hands on the control yoke and made a very rapid application of up elevator simultaneously with Captain White. The pull up was so severe that the crew was pulled into their seats by the G force. radio, “Mayday!” “Mayday!” “Mayday!” This is Eastern 853, we have had a mid air collision and are …Ah … in trouble. Were out of control. We’re in dive now, climbing now, we’re descending, we’re at, ah 7,000 feet.” At 16:24 Greenway was back on the radio advising New York on the situation, New York was giving Eastern 853 heading , when Captain White responded, “We’ll just do the best we can, keep an eye on us, please, and see we’re gonna wind up.”While diving the crew could not regain control of the aircraft, there was no response from the controls or trim tabs. The only way they regained control was with power applications of the throttles. The aircraft began to zoom up and down several times into the clouds. Finally after expert maneuvering of the throttles a setting was found which would maintain a descent and level attitude with some degree of consistency. Passing over the Danbury airport at 2,000 to 3,000 feet, which was too high for them to make an approach. They could only maintain airspeed of between 125 and 140 knots, the whole time the aircrafts nose would rise when power was applied and fall off when power was removed. Their rate of descent was maintained at approximately 500 fpm. The aircraft was continually circling to the left, by manipulating the throttles and causing the engines on the left wing to run faster than those on the right, this helped maintain a steady altitude and slowly stop the aircraft from continually turning to the left. Amongst all the stress and dealing with the emergency Captain White was also able to make an announcement to the 49 passengers. Captain White and the crew new it was apparent that the flight could not be maintained and a decision was made to effect a landing in an open field. Excerpts from the article “Ten Minutes to Live” by Warren R. Young, “The field was clear of animals, but three boys were walking across it. The oldest boy, Danny Williamson, yelled at his brother and their friend to jump over a stone wall edging the field. There was no time to run farther, and they crouched there as the big ship rushed right toward them. In the field stood two houses and a large barn with a concrete silo. To use all the field for his landing Captain White had to coax his plane down almost to roof level and fly between the buildings. In the barn were 20 saddle horses, two horsewomen, a groom and 14 year old Geoffrey von Kuhn an after school stable boy. To make the crash resemble a landing. Captain White had to make the plane perform one more last maneuver, the most critical of all. He could see, as they closed in through the dusk, that because of the slope of the hill, they would bore nose first into the earth if nothing was done. All of his pilot training teaches him, when landing a normal plane, to pull back on the control yoke and shut down the power so the aircraft will settle gently to earth. But with no controls, Captain White would have to put the power on again to lift the nose. If he did it a second or to soon the plane would zoom up, miss the field and stall and drop in a flaming heap. If he did it a second to late, the nose would not lift in time and the plane would smash harder into the ground. Co-pilot Holt saw the need, too, and reached out to shove the throttles, but the captain’s hand, already there, had chosen the moment. White revved all the engines to full power and at the precise instant need to tilt the nose up before impact. Now as the belly of the ship skimmed above the grass at the bottom end of the field, the left wing smashed into a tree about four feet above the ground. The wing tore completely off at the root. The rest of the plane slammed against the far bank of an unavoidable gully, bounced through the air and skidded thunderously up the hill. At impact there was a might explosive ‘Whoomp”, and a huge yellow flame shot 100 feet skyward. Nine and a half minutes had gone by since the collision in the air. As the broken ship slid up hill, huge pieces ripped off and bounded up the field. All four engines broke free and hurtled after the plane. The remaining tail section fell off. The jagged stub, where the left wing had once been, dug deep into the ground, catapulting the sliding hulk of the plane around to the left. Under the stain the fuselage cracked like an egg shell into three pieces. By the time it came to a stop 700 feet up the hill, ( and about 150 feet from the boys) it lay like a nearly closed hinge with its front and rear ends pointed roughly down the slope toward the northeast. Stewardess Kathy DePue kept trying to walk down the isle to help a woman passenger out, but her efforts seemed to be turning into slow motion. Crying for help, she turned over the job of helping the woman to some men, and staggered out upon the hill, where one of the soldiers carried her to safety. She had a crushed spinal disc, that would have to be removed. The other stewardess, Patricia Skarada, had just leapt out the broken fuselage when she heard a young mother moaning, and saw her still in the wreckage. Pat took the baby from her and led her out of the plane. Then she hurried back in to help other passengers. Later she saw Kathy DePue lying on the ground where the soldier had placed her. Pat bent over to see how badly Kathy was hurt, then found that she could not straighten up. She had five broken bones in her back. A soldier Pvt. Dennis Flucker was in trouble. His buddies tried to help him unfasten his jammed seat belt without success. Finally the heat of the flames drove them to make their own escape. Along with the passengers ambulances carried away the co-pilot and flight engineer. Emile Greenway was able to walk, and was found sitting near the stone wall with a bad gash on across his ear and head. His left hand was cut, probably by the electric switches he flicked off at the last moment. But he was in shock. His memory of all the events from the final approach onward was wiped out, and in fact he would remember nothing that happened during the next two days. Apparently he left the cockpit through a crew door beside his position. Co-pilot Holt was more badly hurt, and his escape from the plane had been difficult. Holt crawled or fell out of the small sliding window on the left side of the cockpit, the captain’s side and then collapsed in a heap. Neither Holt or Greenway has ever been able to recall whether he got out by himself or was helped out by the captain. And to this day no one can say with certainty just what happened to Captain Charles White. It seems clear that, immediately after the crash, he had no serious injuries. He had brought his stricken aircraft down by means of superb talent and unshakeable nerve. There is little doubt that Charles White could have walked out the wreckage to join the living and to enjoy the acclaim he had earned, but the rule of air travel, as at sea, that the captain is the last to leave the ship. His younger brother, Lou, remembers the time Chuck White confided his own concept of duty, during his Air Force days. News reported a story about a bomber crash in which the pilot parachuted to safety but all the other crew men went down with the plane. “If a plane of mine ever goes down, “ Chuck said, “Even the dead men are going out on parachutes before I do.” His words were more than prophetic. For one thing is certain: Captain White was later found, not in the cockpit but back in the passenger cabin. All the available evidence shows that, alone in the cockpit and with two open ways to get out, he faced up to his final duty. Just nine and a half minutes after the mid air collision, as oxygen bottles blew up and the flames and smoke billowed ever more fiercely throughout the plane, he walked back to try save the last passengers. There are faint clues that he succeeded in unfastening Private Flucker’s seat belt and then turned d to lead the way out. There, perhaps 30 seconds later, along with Private Flucker, Captain Chuck died, overcome by the poisonous fumes emitted by the fire. During the time prior to collision, the seat belt sign aboard EA 853 had been on. At collision, passengers reported a jolt and change of attitude followed by an altitude loss and varying degrees of recovery. The captain advised passengers that there had been a collision, that he was unable to control the aircraft and that they should prepare for a crash landing. Passengers were advised by a stewardess to remain seated, fasten their seat belts, and read the emergency instruction cards in the seat back pockets. The captain was again heard over the cabin address system and stated the aircraft was definitely out of control and that a crash landing would be made. He advised everyone to remove sharp objects from their pockets and to fasten their seat belts tightly. Just prior to impact, the captain announced: "Brace yourselves!" At impact, there was a continuous upslope yaw to the left. The fuselage aft of the trailing edge of the wing broke open on the right side, "hinging" on the left side. All passengers with the exception of one who believed he had been thrown clear of the fuselage during the slide, and another who jumped out of an emergency exit window after it popped open before the airplane came to a stop, remained in the fuselage in the vicinity of their seated locations throughout the crash sequence. Seat l4-CDE located at the fuselage break, was the only seat not found in the fuselage wreckage and was located 10 yards back along the crash path. All other seats remained in their relative original locations. Some passengers found themselves out of their seats following impact and several had difficulty unfastening their seat belts. Passengers exited through the torn-open fuselage, the right side forward cockpit crew door, the left main cabin door, and the opening in the aft end of the cabin in the pressure dome area. Two bodies were removed from the fuselage. Death was due to inhalation of products of combustion. The captain's body was found just inside the fuselage in the left forward service doorway. A passenger's body was found in the forward passenger cabin in the left aisle area between seat rows 7 and 8. Two passengers succumbed later at a local hospital of injuries received in the crash. There were no structural, power plant, system, or navigation component failures that contributed to this accident. The investigation, including the testimony of all surviving crewmembers, substantiates that both aircraft were capable of operation within their design criteria. Flight 42 (N748TW) was certificated and maintained within the framework of the existing Federal Aviation Regulations and company rules in effect at the time of the collision. The static system design incorporates separate static systems for the captain's and first officer's positions. The altimeter scale error correction at 10,000 feet is usually much less than the 80 feet maximum tolerance. During the several flights flown after the completion of the phase check, there were no reported discrepancies in the altimeter systems. The testimony of the first officer of EA 853 that nothing abnormal was noted in the altimeter system during the flight from Boston. Eastern Air Lines procedures require altimeter change if the crew notes as much as a 50-foot difference in readings. The Board must rule out the possibility of collision because of altimeter malfunctions or false altitude indications. The possible errors caused by altimeter system design, scale correction, and atmospheric conditions are so negligible that both aircraft would not have been more than approximately 100 feet above or below their indicated altitudes. 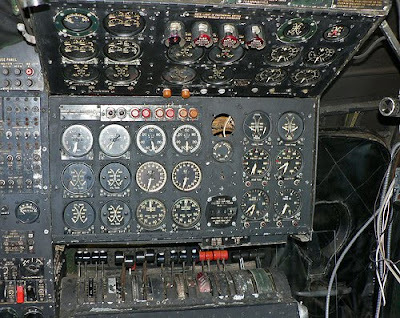 The design incorporation of separate aircraft altimeter-static systems on the EA 853 aircraft would make it highly improbable that any significant errors would go undetected by crewmembers. In addition, there were no reported discrepancies in the altimeter systems of either aircraft during the previous several flights and surviving crewmembers stated there was nothing of an abnormal nature noted in the altimeter systems of their respective aircraft just prior to the collision. It is therefore concluded that the maintenance of the altimeters system aboard EA 853, while not meeting standards as specified in the maintenance manual, was not a factor in the accident. Testimony and flight recorder data indicate that TW 42 was being flown in accordance with the clearance issued by Air Traffic Control. Just prior to arriving at the Carmel VORTAC from the northwest, the aircraft had been descended to an altitude of 11,000 feet and was flying above a cloud deck with no restrictions to visibility. EA 853 was being operated in accordance with the clearance issued by Air Traffic Control and was in level flight at 10,000 feet, in and out of the tops of clouds as it approached the Carmel, New York VORTAC from the northeast. This conclusion is based on the surviving crewmembers' testimony, passenger statements and testimony as to cloud conditions being experienced just prior to the accident, and the flight engineer's log of EA 853 made some 20 minutes prior to the accident. Both aircraft were being operated on IFR flight plans and were under the control of the New York ARTCC. Altitude separation between these aircraft was being provided in accordance with existing procedures. Neither aircraft was given (nor is there a requirement to give) an advisory as to the presence of the other aircraft even though the controllers testified they observed the converging tracks. Both aircraft had reported to ATC at their assigned altitudes and all evidence indicates they were flying at these altitudes shortly before the collision occurred. There was a solid overcast in the vicinity of the Carmel VORTAC. New York Weather radar showed tops 12,000 to 16,000 feet to the north and 8,000 to 12,000 feet to the south. 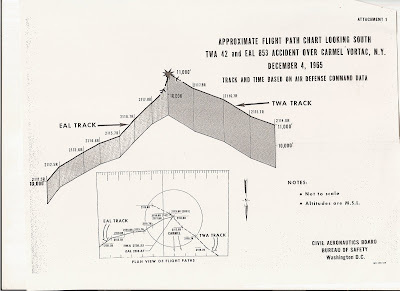 Pilot reports, passenger reports, and crew testimony establish that in the near vicinity of Carmel, the tops were generally at 10,000 feet with small buildups or puffs in evidence. The first officer of EA 853 testified that the crew departed from their assigned altitude when they sighted the TWA aircraft. This departure occurred because the first officer, and apparently the captain, believed the aircraft he saw was on a collision course, at or very near the altitude of EA 853. The Board believes this impression was caused by an optical illusion. A review of the weather information obtained during this investigation shows that the cloud tops were relatively smooth with some "cauliflower" type buildups protruding several hundred feet above the general cloud tops. The evidence also indicates the tops of the clouds were generally higher to the north and northwest of Carmel. The first officer, knowing his aircraft was passing through or very near the tops of the clouds, observed another aircraft on a converging track. With higher clouds behind TW 42, the first officer would receive an impression of an aircraft on or very near the apparent horizon. In the small amount of time that he had to judge the separation of the two aircraft he had no visual aid to assist him in determining the .JPG"> horizon and the buildup of clouds toward the north would present a false horizon on which to base his analysis of separation. The most logical explanation of the reaction pull-up is again based on the small amount of time the crew had to evaluate the relative position and course of the other aircraft. They would not have been able to determine whether the other aircraft was in level flight in or just above the tops of the clouds or in the process of letting down and just entering the clouds. Had EA 853 pushed over, the aircraft would have gone into the solid overcast and the crew would have had no way to observe and evade the converging traffic if it were also entering the clouds. As the captain of TW 42 sighted the other aircraft, he also believed he was on a collision course with it, made an immediate right bank and pulled back on his yoke. He testified that he realized the bank to the night would not allow his aircraft to pass clear of the other aircraft and he attempted to reverse the direction of bank and pushed the yoke forward. There was insufficient time for the aircraft to react to this control reversal and the aircraft's left wing, outboard of the No. 1 engine, struck the right horizontal stabilizer of EA 853. The flight recorder data indicate that approximately 13 seconds prior to impact, TW 42 was maneuvered in a manner which produced a 2.5 "g" load. This time period correlates with the testimony of the TW captain that as he sighted EA 853, it assumed a climbing attitude, and the TWA captain rolled into a right bank, and pulled back on the yoke. This is compatible with the time required for EA 853 to climb he thousand feet or portion thereof, separating the two aircraft. The left wing of TW 42 sliced through the right horizontal stabilizer of EA 853 from a point near the leading edge of the right hand vertical fin and horizontal stabilizer exiting near the center of the trailing edge of the elevator. The swath through the stabilizer formed a relative angle of 12 degrees forward of the stabilizer rear spar. The Board does not have sufficient information to determine the exact pitch, roll, and yaw attitude in reference to the horizon of each aircraft at the time of the collision. However, the scuff marks and break-up pattern indicate a collision angle of 74 degrees between the longitudinal axes of the two aircraft. By plotting the geometries of the impact angle with the heading of TW 42 established from the flight recorder readout as approximately 139 degrees, it was determined that EA 853 was on a heading of 213 degrees and at an approximate airspeed of 140 knots. Flight test data from the Lockheed L-1049C test flight and data supplied by the aircraft manufacturer indicate that the expected decay of airspeed from the estimated 210 to 215 knots cruise speed of EA 853 during a rapid pullup of 1,000 feet would result in airspeed of from 130 to 150 knots. As TW 42 passed under and toward the rear of EA 853 the No. 1 engine cowling and a portion of the left wing of the former struck the underside of the main fuselage of the latter. This impacting tore out the hydraulic boost package and the control cables to the rear empennage of EA 853, effectively rendering the elevator and rudder flight controls inoperative. The pilots' abilities to effect visual separation in the short time of visual contact provided insufficient response time for collision avoidance. 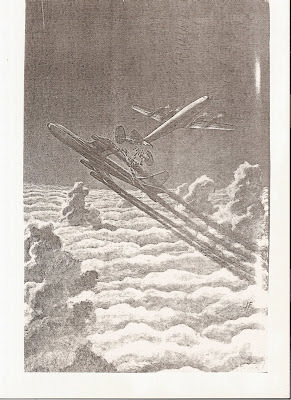 Analysis of the cloud conditions, the positioning of the two aircraft, and the reactionary evasive maneuvers attempted, left no opportunity for a frame of reference to the horizon. The up-slope effect of the cloud coverage resulted in a misjudgment by the crew of EA 853 of their altitude separation, the resultant evasive maneuver, and the subsequent reactionary evasive maneuver by TW 42 ended in collision. Both aircraft crewmembers were properly certificated and trained for the operation involved. TW 42 was properly certificated, maintained, and dispatched for the flight. EA 853 was properly certificated, and dispatched and was capable of safe flight. Altimeter (SN 197523) had been modified in compliance with Kollsman Service Bulletin No. 9, and should have been capable of meeting the performance requirements of TSO C-10A. Both aircraft were capable of operating within their normal design limitations. The powerplants of both aircraft were developing power to the time of impact. TW 42 crew reset the altimeters to 29.63 upon passing through 18,000 feet on their descent. EA 853 was given the Bradley altimeter setting of 29.58 upon passing Hartford Connecticut. EA 853 was at or near the assigned altitude of 10,000 feet just prior to sighting the TWA aircraft. In the Carmel, New York area at the time of the accident there was an overcast cloud condition, the tops of which were generally just above 10,000 feet m.s.l. Buildups were scattered through the area with tops tending to be higher to the north than to the south, providing an apparent upslope condition to the north. The crew of EA 853 observed TW 42 at about their 2 o'clock position and believing them to be at their same altitude on a collision course, executed an emergency pullup to avoid a collision. The crew of TW 42 had an instantaneous view of the EAL aircraft and executed an immediate reactionary evasive maneuver by making an abrupt right turn. The left wing of TW 42 collided with the right vertical fin and horizontal stabilizer of EA 853. The aircraft collided at an altitude of approximately 11,000 feet at approximately 1619 e.s.t. The Board determines the probable cause of this collision accident was misjudgment of altitude separation by the crew of EA 853 because of an optical illusion created by the up-slope effect of cloud tops resulting in an evasive maneuver by the EA 853 crew and a reactionary evasive maneuver by the TW 42 crew. 37,000 feet pressure altitude: A flight level is stated in hundreds of feet at 18,000 feet or above in the United States and is always related to an assumed sea level pressure or reference datum of 29.92 inches of mercury which is set into the altimeters. All times hereinafter are eastern standard based on the 24-hour clock. The nearest official surface weather observations to the scene of the accident were made at White Plains, New York, which is located approximately 14 nautical miles southwest of the Carmel VORTAC. Semi-automatic Ground Environment System. The SAGE centers were Detroit, Boston, and New York. "8" An acceleration equal to the acceleration of gravity. A study of Requirements for Pilot Warning Instrument for Visual Airborne Collision Avoidance, Sperry Cryoscope Company, December 1963. Distance between aircraft either vertically or horizontally. Sight-line rate is the observed angular velocity or relative movement of a target in a horizontal or vertical plane. Range-rate is the observed rate of change in angular subtense of a target or the rate at which the target appears to change in size as the range opens or closes. Eastern Airlines Captain, with a very unusual career in professional aviation. I guess you could say my career started when I was a little boy from Southern California with a very big passion for flying a really big airplane someday! Well I new that someday that all my dreams of flying would come true. And they did. After flight instructing at the long gone, old Grand Central Airport, in Glendale, California, I landed my first Airline Job flying for the United Nations Peace Keeping Mission in the former Belgian Congo, flying DC-4'S. My next job was with Flying Tiger Lines, AKA Fedex. And my next and final job in commercial aviation was i can proudly say was with Eastern Airlines. to B-727. Am sooo proud of my Eastern Airlines 20 year pin, old Captain Eddy Rickenbacker's 82nd Aero Squadron,the Uncle Sam's Hat in the white gold Ring. I study history and disasters in the Greater NY Area. I have the highest admiration for pilots and those in the avaition industry. When I was a boy, I used to dream about being one of you guys. Eastern Captain Charles White was my mother's brother and a wonderful uncle. Only a month before the accident Uncle Charlie came to dinner at my parent's house outside Washington, DC and I remember my dad asking him if he had to choose between making an emergency landing on land or water what would he choose? My uncle immediately said "land." He then added "if we landed on water instead of land we would have a better chance of saving more passengers and crew. I would not want to run the run the risk of having people survive the crash only to drown afterwards." Only a month later he had to make that fateful choice. My mom and uncle also had another sister, Elsa, who lived with my uncle Loren in Ridgefield, CT. just 3 miles from the crash site i North Salem, NY. They actually saw the connie circling overhead and somehow she just knew that it was her brother's airplane. They arrived at Hunt Mountain right behind the fire engines. Mrs. Styers told my aunt that she had seen the captain outside of the aircraft and she told him about the young Army recruit who was trapped in his seat. She said she saw him reenter the plane but did not see him after that. My aunt and uncle spent the entire night driving and walking through the fields and woods surrounding the crash site thinking that perhaps he had wandered off injured. I remember the phone ringing at 3 am to tell us the news. The next morning they found his body just a few feet inside the forward entry and the body of the young man right behind him. He had succeeded in freeing him and was leading the way out again when (it has been speculated) that he was either overcome by smoke or died when an oxygen bottle exploded from the heat. My incredible uncle was buried with full military honors at Arlington Memorial Cemetary and with a long line of Eastern captains in full uniform saluting him. Many of the survivors also attended. People were stopping their cars along side a nearby freeway and stood there in respect and silence. My grandmother was personally escorted to Washington by Eddie Rickenbacker who held her hand through the entire flight. I have my uncle's picture on my desk in his Eastern uniform as I type this. Both Emile Greenway and Roger Holt kept close contact with my aunt Angie in New Hampshire and for the rest of their lives they would come by to make repairs, cut the grass and just take care of her. I just retired after a career of 38 years of airline flying. It was always to my regret that he never had a chance to see that. I also have the original artwork of his picture that appeared in Reader's Digest and my aunt found his half burned log book in the field after the crash and I have that too. No nephew could be more proud. On behalf of my family, I thank you for taking the time to recognize a truly heroic pilot. My father, Raymond Barker, survived this plane crash because of Captain White's amazing flying abilities. Like Captain White, my father went back into the burning plane to help his fellow passengers. While he did this, unbeknownst to him, his back was broken. Also, in doing so, my Father's lungs were burned which eventually caused him to develop emphysema, which claimed his life in 1991 at the age of 62. My name is Martin Ernst, from Cochabamba. Bolivia. I must habe been 4 years old when a relative read to me the article in Readers Digest. I was very impressed by this mid-air collision, specially impressed by the courage of the Constellation captain. 45 years later I read again about this incident, and want to leave this few words as an expression of respect. My name is Jeff Klein. I was a 21 year old college student when Captain White saved my life that late December 4th afternoon. There were several minutes between the moment we collided with that TWA jet and when we hit the ground. During that time, I had a feeling that the front of the aircraft would be crushed upon impact, so I actually changed my seat from the front end of the airplane to another about two-thirds of the way back. What few people know is that I originally sat across the aisle from that young soldier who was killed with the captain, and before I began to to make my way towards the back, I encouraged that recruit to go with me. He refused, and there was no time to argue. Since then, when I think of that unbelievable experience, I wonder if either he or Captain White would have made it that day, and I always remember to say a silent thank you to that brave, brave pilot, just as I'm doing so at this very moment. I was 8 years old when that happened. We lived in South Salem, NY. My dad was a volunteer fireman and I rode with him out to that crash site. The scene is still etched into my mind at the age of 57. Wonderful article of outstanding Heroism, Duty, Fate, and Superior Airmanship. This incident has always intrigued me, as I lived with my Mom, Dad, and 3 other brothers in a farmhouse in North Salem, NY that had a clear view up (what we called) Titicus Mountain, just a few short years after this crash (1968). In our teens at the time, my brothers and I would often walk up to the cow pasture there, and some physical evidence of the impact was still present. I would like to know whether there are any known photographs of the incident? Here is a recent article about the crash. There is an aerial photo of the crash site in the article. Never before have I been more proud of my family. I'd like to thank all the people who have left positive comments regarding the heroism of my grandfather, Charles White. My grandmother was also one of the passengers whose life was saved due to the heroic actions of Captain White that day. My family will forever be grateful to him and I send my heartfelt sympathy to his family for their great loss.